In an age of economic globalization and outsourcing, corporate downsizing and layoffs, staff and benefit reductions, "cooked" books and corporate fraud, the poignant story of Piedmont Airlines is a shining example of what can be achieved in corporate America. While it's been nearly 20 years since Piedmont Airlines' merger with USAir, Piedmont remains a brand worthy of recognition and salute. Even today, former employees meet regularly to reconnect with their Piedmont family and to reminisce about the company and its founder, Tom Davis. Through the Piedmont Aviation Historical Society, the airline's alumni roster still brims with former employees who want to preserve the legacy of how one small company made it big without compromising its values or its employees. In Piedmont: Flight of the Pacemaker, the long-awaited story of Piedmont Airlines is finally recorded in a compelling account. Author Frank Elliott carefully documents the airline's milestones in a fast-paced and intimate journalistic style based on research and stories shared by former employees. 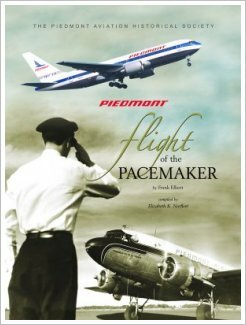 Published by the Piedmont Aviation Historical Society, Piedmont: Flight of the Pacemaker is a must-read for aviation buffs, corporate managers, business students, and other aspiring pacemakers. Piedmont: Flight of the Pacemaker is a four-color, hardcover 9 x 12-inch coffee table book. The entertaining narrative is studded with over 600 photographs of Piedmont Aviation staff, airplanes, company memorabilia and more. The book's cost is $52.00 and includes a DVD of a profile on the late Tom Davis	produced by the NC BUSINESS HALL OF FAME. Proceeds benefit PAHS and the aviation-related charitable giving of the TOM DAVIS FUND.